“Flow State” or being “in the zone” describes a person being completely absorbed in what they are doing. This often leads to higher productivity and greater enjoyment of the task. Flow state is exactly how I feel about knitting. When I really get into a rhythm, the stitches just flow. It is almost a form of meditation, which helps me relax and reduce stress. I named this scarf “Flow State”, not only to represent this form of concentration when knitting, but also to represent the flow of a river. The curves flow along the length of the scarf just as a river flows around its banks. 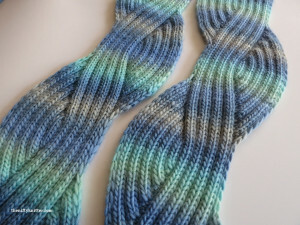 The scarf is thick and squishy, perfect for cold weather days. 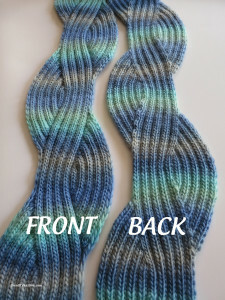 The ribbed pattern is also reversible. Finished length is 62 inches (157 cm). For a longer or shorter scarf, work fewer or more repeats of the charts. 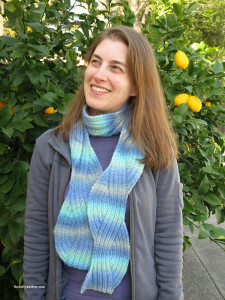 Types of stitches required: knits, purls, increases, decreases, slipped stitches. Size 8 US (5mm) needles. Approximately 250-275 yards of worsted weight yarn for a 62 inch (157 cm) length scarf.